The Charm's history is rich in Dresden, Ohio. In April of 2002, The Charm of Dresden opened it's doors in a small building across from the Feed Mill on 7th Street. Today, after two moves, The Charm of Dresden stands blessed and much bigger, on the corner of Main and 6th Street. They pride themselves on carrying a variety of unique and hand picked gifts and jewelry that keeps their customers coming back to their boutique and shopping on-line again and again. So what does the Charm of Dresden Offer? Charm of Dresden is your destination to find the areas largest selection of Kameleon jewelry, Trollbeads, Goodworks bracelets, Holly Lane, Ginger Snaps and Fenton Art Glass Jewelry that is proudly handmade in the USA! The Charm of Dresden is your headquarters for Powder Scarves, Tickled Pink and Spartina handbags and accessories. Looking for the perfect "girlfriend gift"? Check out their new, fun and colorful Suzy Toronto section! I received a beautiful scarf from the Tickled Pink Collection to review. My daughter, Myelie loves scarves. They are a main staple in her wardrobe. 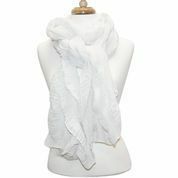 We received the Tickled Pink Long Flowing Ruffle Scarf in White. Long flowing ruffle scarf is actually flowing with beauty...made from 100% lightweigh polyester and come in soft beautiful colors. Need just touch of warm and style...this scarf is for you! Doesn't Myelie look gorgeous in her scarf? Myelie loves her Tickled Pink Long Flowing Ruffle Scarf. It is made from elegant, high quality fabric that is flowy, sheer and adds the perfect touch of femininity and class to any outfit. There are many different styles in which Myelie can wear the scarf to create stylish looks. Beautiful and timeless! Disclaimer: I received a scarf to review and to keep. All opinions are my own.